Writing a cover letter for the job role of a Sales Ledger. If you are looking to get into a Sales Ledger role then you will typically have some experience of administration and accounts and combine the two roles to work in a sales ledger role. You will be expected to deal with all the invoices coming in and out of the business and ensure that these invoices are paid on time. You will need to be very organised and thorough in your work and communicate well on a regular basis and build good working relationships. There are some Accounting qualifications but mainly this role is from experience and learning on the job and through your colleagues than through specific qualifications. Typically a salary for a sales ledger clerk starts at around £16,000 per annum depending on the size of company and team. This will of course depend on your experience and could be less for more of an entry position. To get into the role initially will be down to your previous experience and your methods of working such as having a financial/mathematical mind and being able to concentrate for long periods of time accurately. You may be able to further your career and learn other aspects of an accounts department but it is not necessary for beginning with. 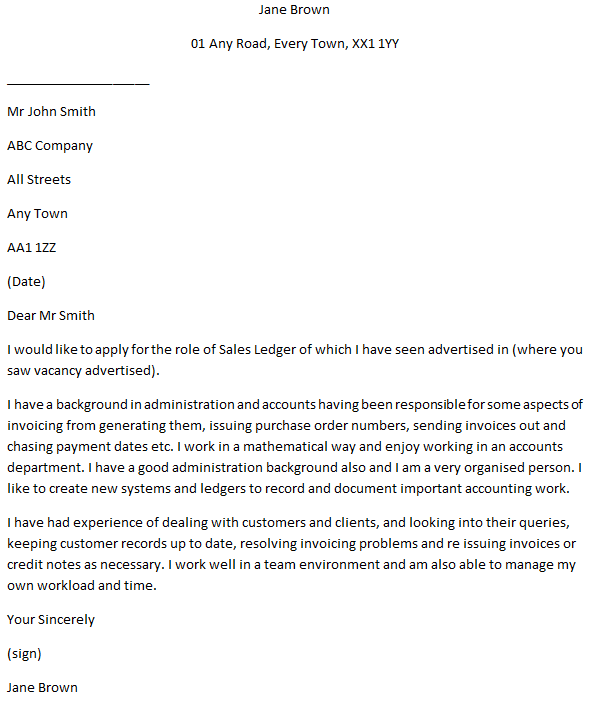 I would like to apply for the role of Sales Ledger of which I have seen advertised in (where you saw vacancy advertised). I have a background in administration and accounts having been responsible for some aspects of invoicing from generating them, issuing purchase order numbers, sending invoices out and chasing payment dates etc. I work in a mathematical way and enjoy working in an accounts department. I have a good administration background also and I am a very organised person. I like to create new systems and ledgers to record and document important accounting work. I have had experience of dealing with customers and clients, and looking into their queries, keeping customer records up to date, resolving invoicing problems and re issuing invoices or credit notes as necessary. I work well in a team environment and am also able to manage my own workload and time. I have enclosed my CV for your consideration. If you have any questions for me, please do not hesitate to contact me.